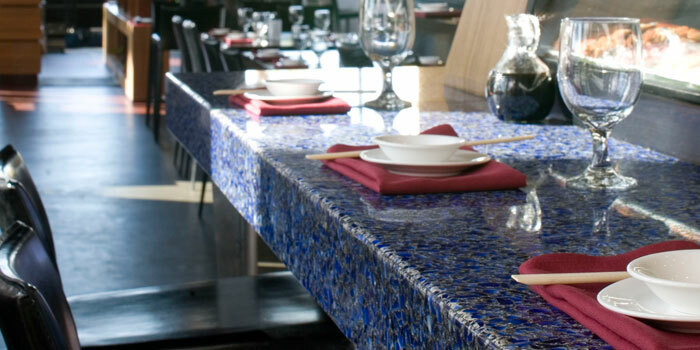 Bar tops made from recycled glass catch light in otherwise dark spaces, provide movement and interest, and when the hue is just right, reflect the brand's signature colors. 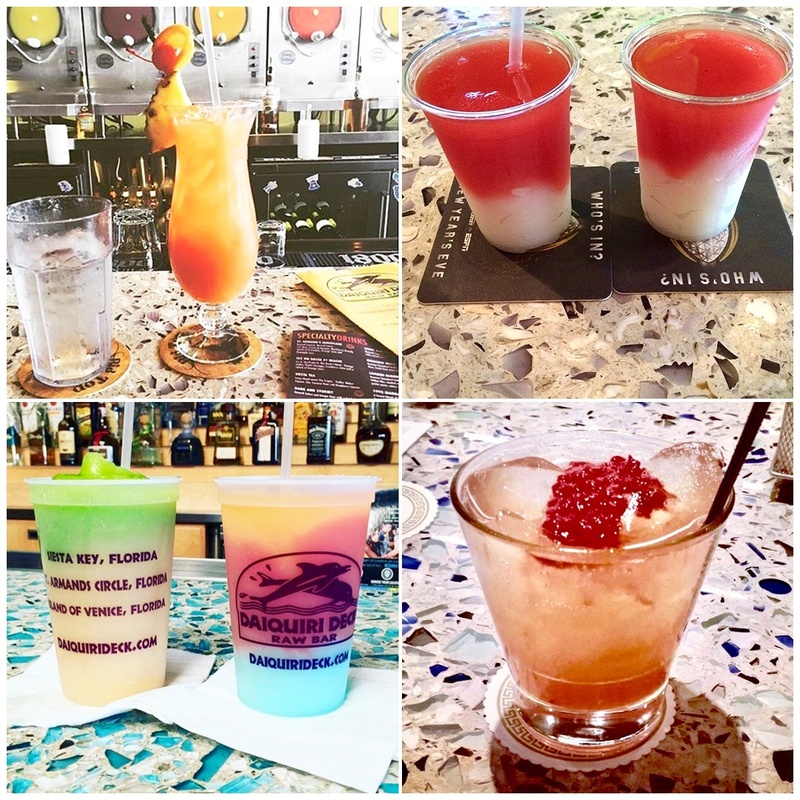 Not to mention it makes a great backdrop for Instagramming your favorite rum punch on trivia night. 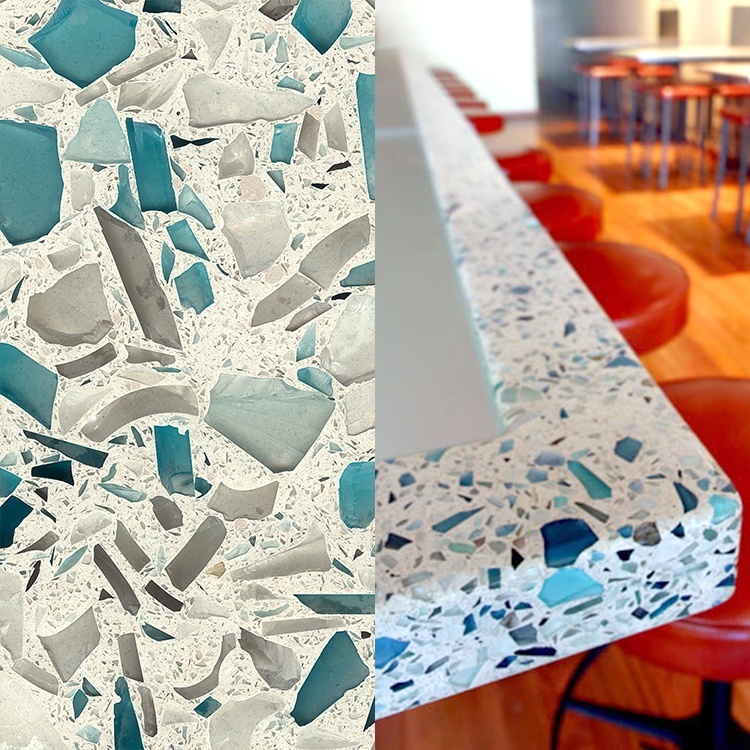 We've collected a rainbow wrap-up of recycled bar tops from around the country. Read on to discover the stylish surface for your next signature cocktail experience. Cheers! 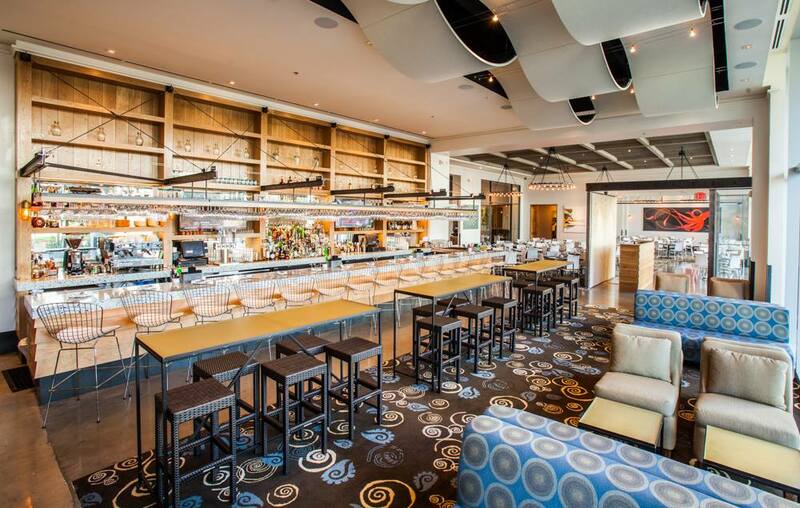 At Caracol in Houston the bar is as long as it is beautiful. 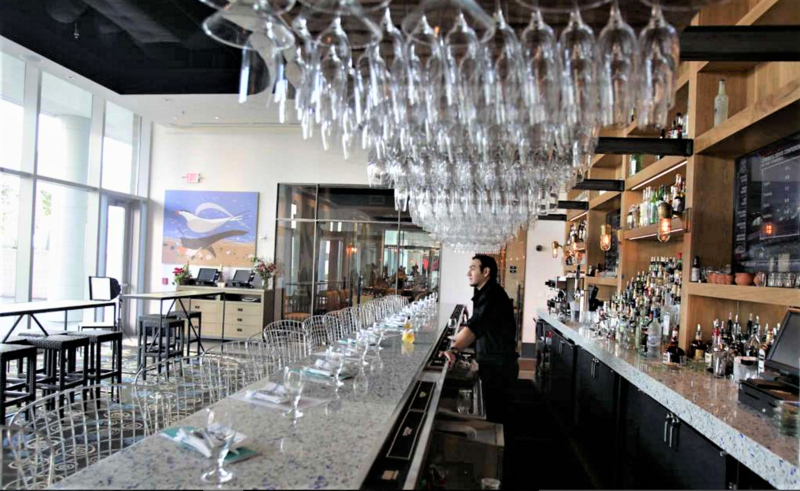 The recycled glass bar can seat about 16 people. The surface captures and reflects the generous natural light from the restaurant's floor to ceiling windows. Fabricated by StoneStore and supplied through Latera Architectural Surfaces. 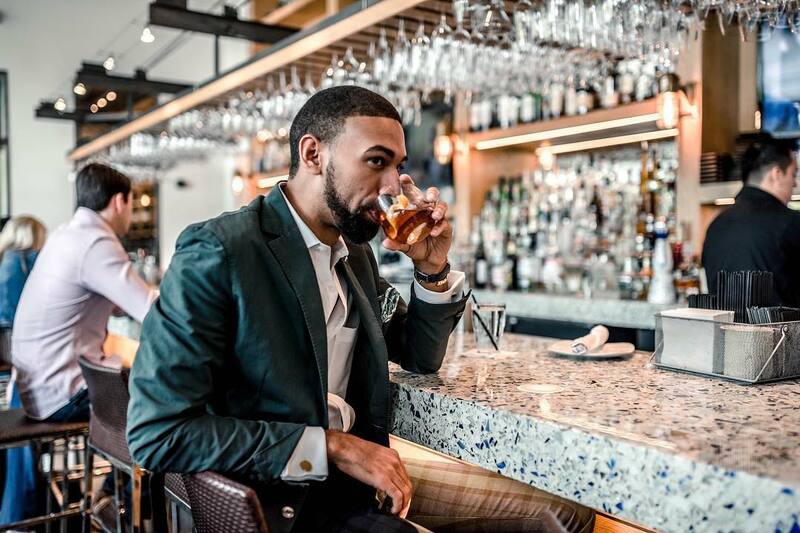 Fashion blogger Sir Josh Aaron sips his cocktail at the Chivalry Blue Vetrazzo recycled glass bar with 4" mitered edge. 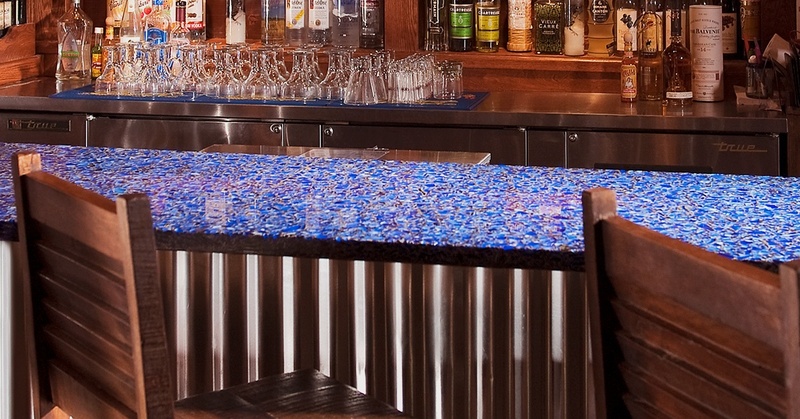 Mini blue glazed tiles complement the cobalt glass of this rectangular bar with rounded corners. Clear acrylic stools keep the focus on the bar top's unique surface. 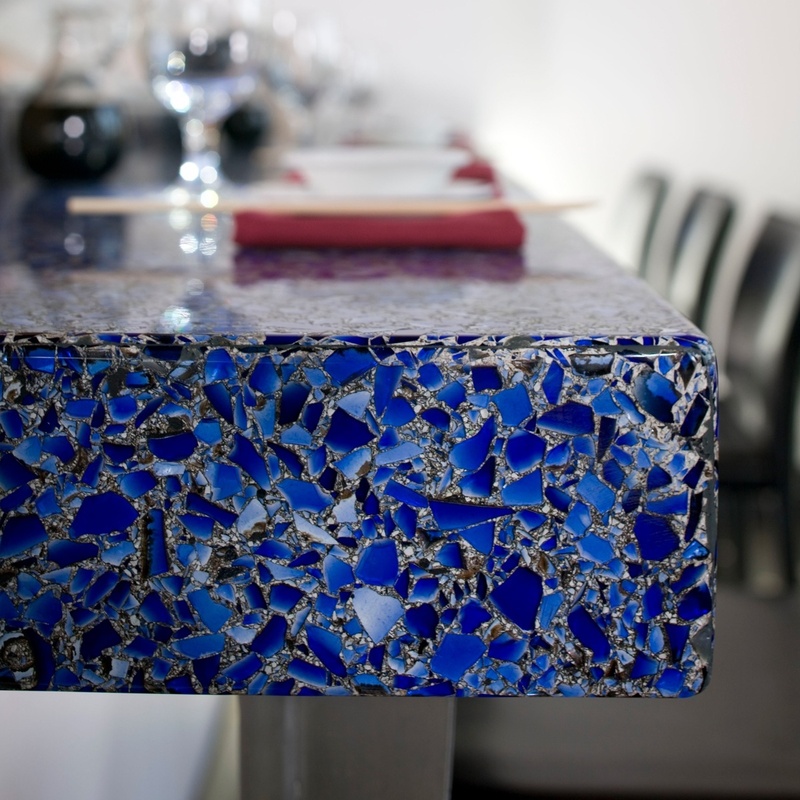 This sushi bar conveys a more elegant look with a patina added to the cement background of the Cobalt Sky. Patina finishes give the glass particles a glowing effect as the light passes through the shard and bounces of the white base back to the surface. Each slab of Cobalt Sky is made with a unique mix of Skyy® Vodka and 1,664 beer bottles, condiment jars, demolition architectural glass and aquariums. We love the blue paired here with warm, dark wood. Supplied by Ciot. 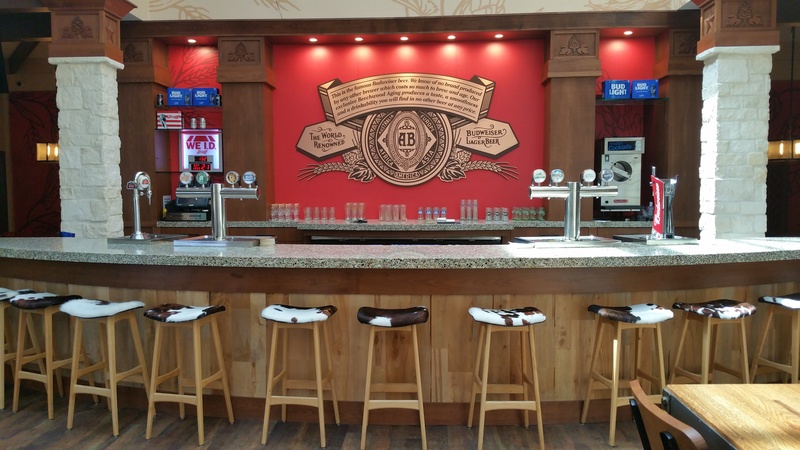 At Anheuser Busch’s Houston Brewery beer fans visit for brewing and history tours before settling down on the cowhide stools at the brewery's expansive bar topped with Vetrazzo’s Alehouse Amber. The recycled glass mix features the classic amber beer bottle as well as green wine bottles in a white cement aggregate. It's modern rustic vide appeals to its customers. Fabricated by JED Countertops ans supplied by Latera Architectural Surfaces. Inspired by sea glass and made from salvaged demolition architectural glass and clear glass bottles, Floating Blue is fun and tropical, a stylish match to these caramel colored leather bar stools, This surface is also available in a Sea Pearl finish with the look and feel of beach glass. 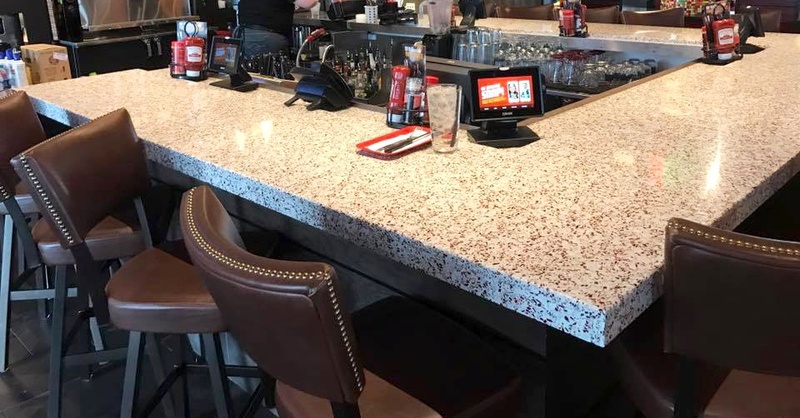 At Red Robin Gourmet Burgers & Brews throughout the US the bars are made with a custom mix of crushed glass aggregate to reflect the brand's signature fire engine red color scheme. 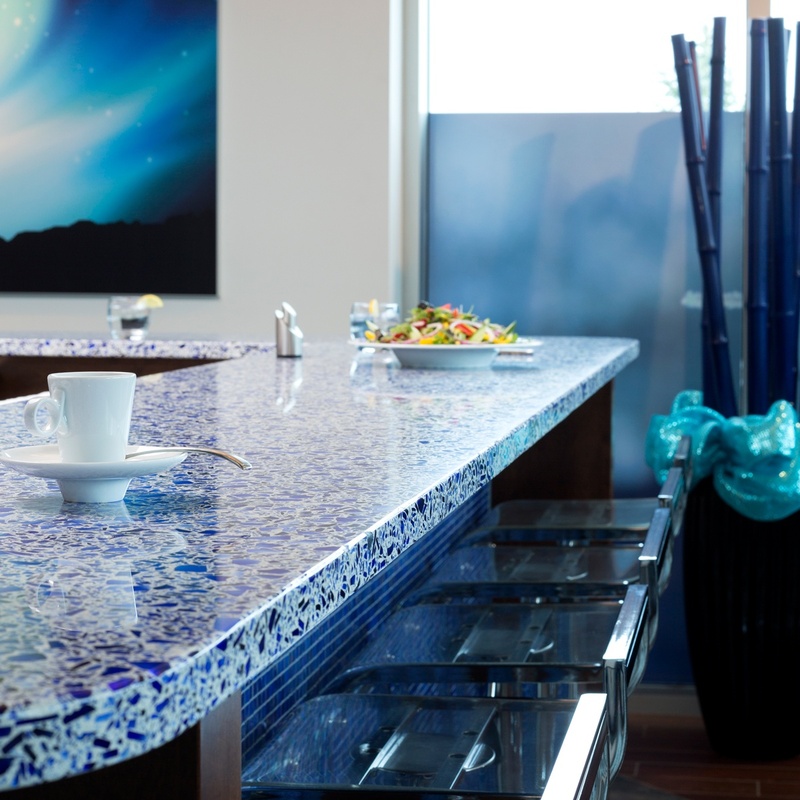 Clear bottle glass pieces balance the color mix and keep the surface engaging without being overwhelming. Working with the designers on the project to develop the right blend of color and pattern resulted in a delectable visual treat. Photo is Red Robin's Chubbuck, Idaho location. Fabricated by Pebble Creek Custom Countertops. 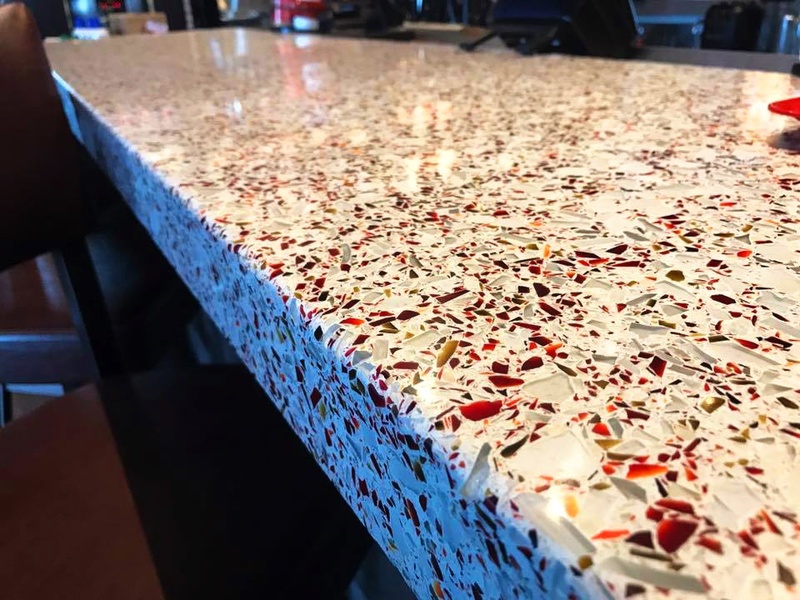 Colorful recycled glass countertops are a nod to any bar's menu - each slab is a mix of glass sources including beer, wine and condiment bottles, many of which originate in bars to begin with, during their first iteration.